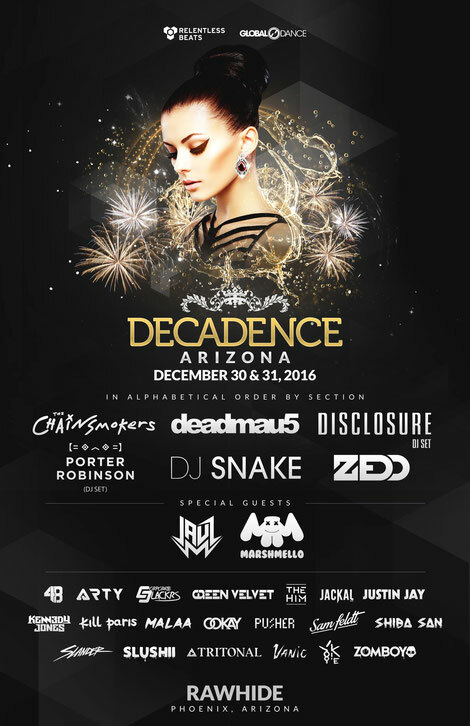 Decadence NYE is Arizona’s first two-day New Year’s Eve celebration and takes place on 30 & 31 December 2016, at Rawhide Western Town & Event Center. Presented by Relentless Beats and Global Dance, the third annual event has previously featured such acts as: Above & Beyond; Adventure Club; Borgore; Crizzly; Flosstradamus; Jack Ü; Kaskade; Knife Party; ODESZA; Pretty Lights; and Seven Lions, amongst others. The 2016 lineup includes The Chainsmokers, Deadmau5, Disclosure, Porter Robinson, DJ Snake, Zedd, Jauz, and Marshmello, to name a few. Rawhide Western Town & Event Center is situated on the Gila River Indian Community and is Arizona’s largest 1880s western-themed entertainment venue. Located just south of Phoenix, the venue is just 20 minutes from the Phoenix Sky Harbor International Airport in Chandler, AZ. Relentless Beats will be transforming Rawhide’s Frontier Hall into the Arizona’s biggest super-club for a decadent two nights. Guests are invited to indulge and live lavishly one last time, as they say good-bye to 2016 and prepare to welcome the fresh beginnings of a new year.